The Seattle-based pizza chain opened its doors in Tacoma, Washington in 1995 and has been rockin' ever since. No, not Grunge, but hard-core rock and roll! The rock-themed restaurant is quickly becoming a neighborhood favorite, with Colorado locations in Lakewood, Highlands Ranch, and now Parker. The owners wanted to keep the rock era alive that they grew up in, so they decided that if they had to be working all day, why not enjoy the jamming tunes that are playing and cool surroundings? There are currently seventeen restaurant locations and more openings are on the horizon. Take a walk on the wild side with ovens that burn almond wood and can reach temperatures up to 900 degrees. 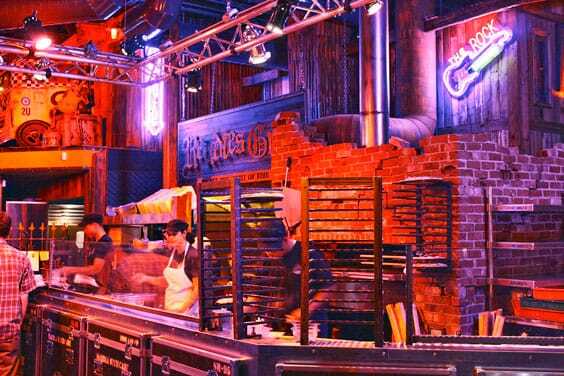 With more than 20 hearty hand-tossed pizza selections, including favorites like "Bang A Gong," "Bad to the Bone," "Satisfaction," "Can't Stop Rocking," and "Stairway to Heaven," meat lovers, gluten-free eaters, and both red and white sauce fans will be pleased. A fun alternative is to simply create your own. It's not all pizza. The Rock does offer a wide selection of appetizers, soups, salads (even a salad pizza), sandwiches, pastas, chicken, and burgers. 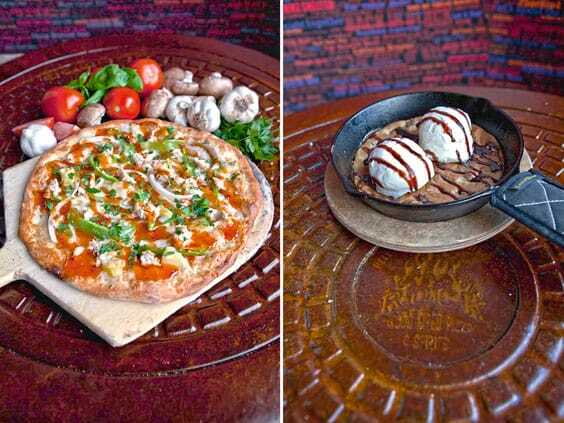 The kids menu is reasonably priced at $3.50 - $4.50, and kids will enjoy waiting for their food with a fresh ball of pizza dough to play with and crayons that won't roll off the table. The music is by no means Disney, but it is amazing how many kids know and enjoy 80's hair band music from video games like Guitar Hero. Kid-free? Head for the bar for happy hour on Monday thru Friday from 3 p.m. to 6 p.m. or from 9 p.m. to close. Appetizers range from $4 to $6, and favorites include the Rock chips, brown sugar mozzarella bread, pulled pork sandwiches or a basket of fries. The chipotle chicken wings are a must-try and are baked in a skillet in the oven. Amazing! No happy hour is complete without fabulous drinks/drink specials. Booze in colorful buckets, jello shots in syringes, and a lava lamp that lights up with floating chunks of jello in it all round out the ultimate bar experience. The Rock features its own microbrew beers - six to be exact. Jump'n Jack Black, Suicide Blonde, Wild Thing Honey Wheat Beer, Rock Steady Red, Lite My Fire Low Calorie Pale Ale, and Sledge Hammer India Pale Ale. Try them all with one of the microbrew samplers! Come to The Rock Wood Fire Pizza and Spirits for great service, delicious food and a rockin' atmosphere. On your next visit don't forget to sign up for the Backstage Pass, and tell them that the Castle Pines Connection sent you! The Rock Wood Fire Pizza and Spirits is located at 19340 East Cottonwood Drive (in the former Boston's right off E-470 and Parker Road). Open daily from 11 a.m. to midnight. For more information, call 303-454-6168 or visit www.therockwfp.com.